On January 22, 2011 conference on “Relations between state and religion in Azerbaijan and Turkey” organized by the Center for National and International Studies was held in Azerbaijan Media Center, Baku. The relations between state, religion and society were viewed in the context of human rights and liberal freedoms in the democratic state. The issue was considered in the comparative context of Turkey and Azerbaijan -such as changes with arrival of Islamic Party ( AKP) to power in Turkey, recent tension between the believers and state in Azerbaijan , and was analyzed from the historical perspective- the beginning of formation of the modern nation states in the 19th –early 20th century. Among the speakers of the conference dedicated to the 93th anniversary of Azerbaijan Democratic Republic, there was a professor of Sakarya University Dr. Alaeddin Yalcinkaya, political scientist Dr. Hikmet Hadjizada, Dr. Shamil Rahmanzada from the National Academy of Sciences and religious activist, leader of Djuma Mosque in Baku Dr. Ilgar Ibrahimoglu. In the early 20th century first Azerbaijan and then Turkey established nation-states – secular democratic parliamentary republics, based on the liberal legislations. 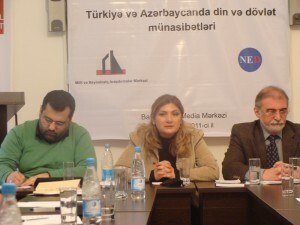 The recent political events in Azerbaijan – the protest meetings to the ban of hijab in Universities and schools in Azerbaijan in a few regions and arrests of the Islamic party leaders etc.- urges the necessity of public debates and finding the place of religion in public life, its place in the context of human rights, of Europeanization, and Azerbaijan nation’s mission in the region and the world. It is already obvious, that there is a number of diverse views on the relations between religion, state and society which are circulating in our society and can be roughly expressed in the following, sometimes contradictory approaches, and which are awaiting for reconciliation. – “the religion cannot be limited in its expressions, as this is a part of the basic human rights”. – ”the perceived inequalities are not contained in Quran, and are just misinterpreted”. – “the religion should be restricted, as religion already creates a threat to the secular and democratic life style”. – “the religious rights should be defended and protected, but they ( religious forces) should accept the liberal constitution”. – “there are other more important things in Quran, like honesty etc., which are violated, but the activists are reacting and focusing on things like hijab”. – “the moderate and true muslims should actively and openly protest against violence, extremism, committed by the other muslims”. – “do not discuss issues of religion, state and society – this will lead to explosion”. – “open and direct discussion of religion and state relations is necessary to prevent explosion”. – “the mission of Azerbaijan, in partciular while integrating in Europe, is to adapt Islam finding such a form, that would eliminate its perception as a closed and threatening religion”. These views should become the subjects of open public debates, so the most optimal and harmonious relations between the state, religion and society would be found without compromising main achievements of the Azerbaijani nation and statehood. Only a wide dialogue of the government with the society, when not a single law or decree is adopted without wide consultations with the population, may help to eliminate tension in the country.